Temple Beth Sholom is a Reform Jewish Congregation located in the heart of Orange County. It was founded in 1943 with 25 families, and now serves 500 families who live in all areas of Orange County. Our Shabbat and Holiday services, Religious and Hebrew School, Preschool, Adult Education Program, Sisterhood, Brotherhood, Social Action, Special Needs Network and Youth Groups are a but a few of the paths to participation in congregational life at Temple Beth Sholom. We are a spiritual, socially-conscious, welcoming and growing family that celebrates our Jewish tradition in a warm atmosphere where all of our members and guests are welcomed. 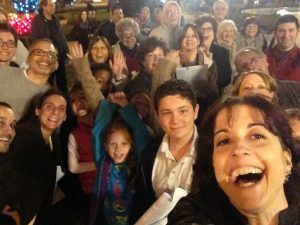 As a member of Temple Beth Sholom, you will have the opportunity to make a difference at our congregation as well as the community at large (just ask how you can get involved). Regular and varied activities take place in and around Temple Beth Sholom and cater to all age groups. Interested in learning more about TBS? Please fill out the form below to download our Partnership Information. If you have any questions or comments please contact our office by calling, 714-628-4600. We look forward to hearing from you soon! We would love to hear from you! Please fill out this form with questions/comments and we will get in touch with you shortly.